Every February, runners from around the country descend on Mayo Clinic’s Florida campus to participate in the 26.2 with Donna — The National Marathon to Finish Breast Cancer. 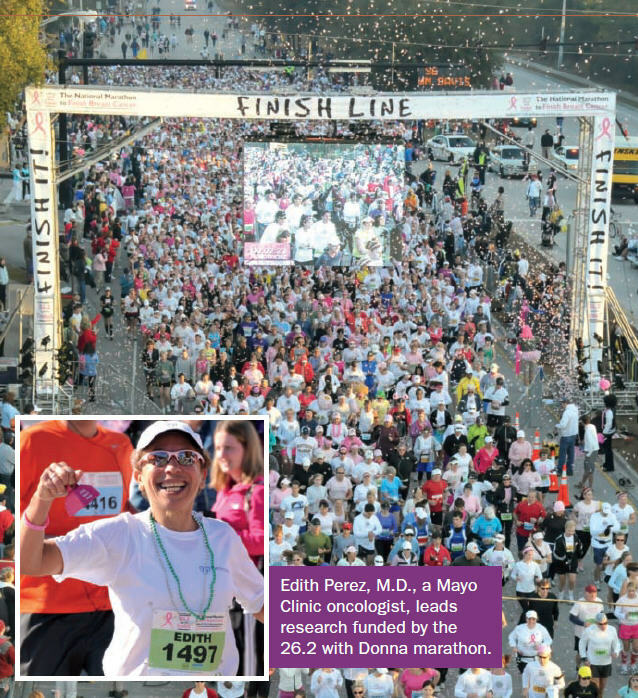 Named in honor of three-time breast cancer survivor Donna Deegan, a Jacksonville, Fla., television news anchor and Mayo patient, the marathon starts and finishes on Mayo Clinic’s campus and attracts more than 8,000 participants. Organizers say it’s the only marathon that donates most of its proceeds to breast cancer research to find a cure for the disease. This year marks the event’s fourth anniversary. More than $1 million has been contributed to Mayo over the past three years. Researchers at Mayo Clinic Cancer Center have used the funds to staff and operate a new Breast Center Translational Genomics Program, which aims to identify specific genes responsible for breast cancer so new therapies can be developed. One of the key initiatives of the center is to identify every gene and protein related to breast cancer. That information has the potential to change all aspects of breast cancer care — from diagnosis to treatment to prognosis, says Edith Perez, M.D., the Mayo Clinic oncologist leading the marathon-funded research. To help achieve their goal, Mayo Clinic researchers are using a “next generation sequencer,” a machine that can scan a person’s entire genome in less than a week. That’s no small feat, since there are more than 2 billion base pairs of DNA, the building blocks for every cell in the body. As recently as two years ago, compiling such a mountain of genetic data would have taken months. It will take many years to achieve the goals that Dr. Perez and her colleagues have for the future of breast cancer care. But they already are discovering exciting leads about the genetic factors that influence breast cancer. For example, the team has identified several fusion gene products — when two previously separate genes become one and sometimes cause cancer — that have never been seen before in breast cancer tumors. “The progress that has been made to date is just the beginning,” says E. Aubrey Thompson, Ph.D., a scientist and member of Dr. Perez’s team. But thanks to the discoveries, Mayo researchers focused on other cancers are also benefiting, Dr. Thompson says.